Bella Caledonia remains free (and ad-free) and takes hundreds of hours a month to research, write, commission and edit. If you value what we do, please consider supporting with a recurring monthly donation of your choosing. GoCardless to set up a small monthly donation to support independent journalism in Scotland. Let us see what the EU does as the world watches the deployment of a Nazi paramilitary to smash a democratic vote. One can see exactly how an unarmed society is an exposed society, and maybe, just maybe, if people had intervened earlier to fight the 1930’s Nazi menace, then the holocaust would not have happened. 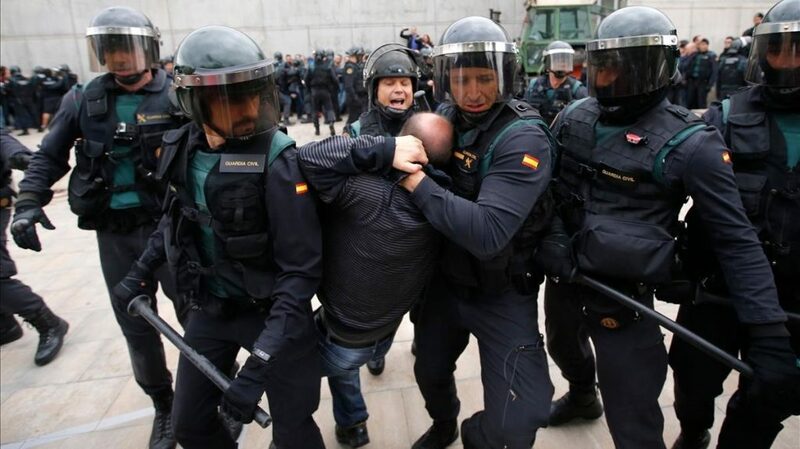 These scenes could be straight out of that era, and sad to say, our own UK government is siding itself with the Madrid Government. But maybe that is because they are exactly the same, and would do exactly the same, as they have done the world over, and more recently during the miners strike or in relatively recent Northern Ireland. And do we think Scotland would be any different if they couldn’t have rigged the referendum. Of course not, ourvown history of the Clearances, and the destruction of the Scottish way of life post 1745 tells us that as well. We have catch’d Scotchland, and will hold her fast. I lived through the miners strike of 1884 -85. in Edinburgh and Fife. All the shadows fell from my eyes then, So sad to see it re-surface in Catalonia -such a beautiful and proud people. If nobody says anything now, if we do not protest, who is to say the British state will not revert to type come the next Scottish independence referendum?